WEST WINDSOR – After leading National Junior College Athletic Association’s (NJCAA) Region 19 in wins and strikeouts, Mercer County Community College softball pitcher Kelly Tohill has been named Division II player of the year by both NJCAA Region 19 and the Garden State Athletic Conference (GSAC). Tohill, a graduate of Hamilton West High School, set the MCCC school record for wins in a season with a 20-6 record. She posted a 2.40 ERA for the season, pitched 134 innings, and struck out 155 while issuing only 27 walks. Her single-season strikeout total is second in school history. As a pitcher, Tohill was in the top 10 nationally in strikeouts and wins. As a batter, she posted a .397 average. 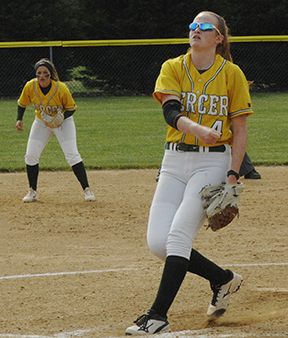 "Kelly was our ace,” said MCCC Softball Coach Ryan Zegarski. “Without her, we would have never achieved a school record of 41 wins." Tohill headlines a total of five Vikings who made the GSAC All-Division II Team, joined by infielders Kaitlyn Stahlbrand, Lauren Bracco, and Tori Carpenter, and outfielder Casey Murphy. Tohill, Murphy, and Stahlbrand were also named to the NJCAA All-Region 19 first team, with Carpenter, outfielder Baily Ferrara, and utility player Kristen Chessman named to the second team. MCCC softball pitcher Kelly Tohill, pictured here as she pitches a shutout against Lackawanna May 25. Tohill was named NJCAA Region 19 and Garden State Athletic Conference Player of the Year.